Manny Pacquiao is a professional boxer hailing from Philippines. He was the second highest paid athlete in the world in 2012 with total earnings of $62 million. He has the unique distinction of being the only boxer to be a world champion in eight different weight divisions. He also has been the first boxer to win the lineal championship in four different weight classes. He has been named the ‘Fighter of the Decade’ by the World Boxing Council (WBC) and the World Boxing Organisation (WBO) for the decade lasting from 2001-2010. He has won the Best Fighter ESPY Award in 2009 and 2011. For more than 7 years Manny Pacquiao was rated as the best pound-for-pound boxer in the world. Emmanuel Dapidran’ Manny Pacquiao was born in Bukidnon, Phillippines on December 17, 1978. He is the fourth of six children who were raised up by a single mother. Their family lived in extreme poverty and thus he had to drop out of school because his mother was unable to pay the school fees. 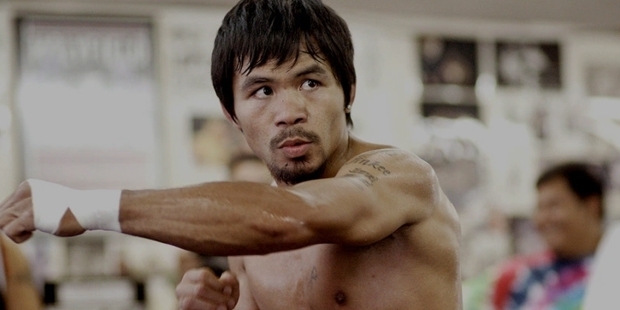 At the age of 14, Manny left his house and went to Manila in order to earn little money. Instead of finding work he began boxing in the streets and soon he was selected to the National Amateur boxing team. He was provided food and boarding which helped him concentrate solely on improving his boxing skills. He impressed his coaches by achieving a record of 60-4 in a total of 64 amateur fights. At the age of 16, Manny decided to pursue a career in professional boxing. He weighed only 98 pounds which was 7 pounds lesser than the minimum qualification for the light flyweight category. But Manny wanted to prove himself as quickly as possible. So he put weights in his pockets so that his weight would show in excess of 105 pounds. He first professional match was against Edmund Ignacio which he won in 4 rounds. As this match was telecast on national television, he became a star overnight. Soon Manny’s weight increased to 110 and he participated in the Flyweight category. This time he went undefeated for 15 matches and got a chance to face the champion Chokchai Chockvivat. He managed to knock out his opponent in the fifth round and was able to secure the OPBF Flyweight title. This was the first title that Manny had got in his short career. Next he got the chance to fight for the WBC Flyweight title and he won in his first attempt by knocking out champion Chatchai Sasakul in the eighth round. This title bought Manny into the spotlight and made him a darling among his countrymen. When he was stripped of his title before a title defense match because of being overweight, Manny decided to move on to the Super Bantamweight division. Here he was equally successful in winning the WBC International Super Bantamweight title. He got his chance to fight for the World title in June 2001, and he did not miss out on the opportunity by beating Lehlohonolo Ledwaba by technical knockout. Next he went on to fight in the Featherweight division. In November 2003 he beat reigning champion Marco Barrera by technical knockout in the 11th round. This was the pivotal match that went on to define his career. He had now won world titles in three different weight divisions. Manny had now become a global boxing superstar with millions of fans around the world. In 2005, Manny went on to capture the WBC International Super Featherweight title. In June 2008 he went on to win the WBC lightweight title by defeating champion David Diaz. In December 2008 Manny defeated Oscar De La Hoya and won the Welterweight title. He received in between $15-$25 million for this fight. Every year between 2008-2013 he has earned in excess of $50 million because of the number of viewers that tune up to watch his fights. There have been no boundaries to the level of success that Manny Pacquiao has been able to achieve in such a short period. From living in the poorest neighbourhood in Philippines to becoming one of the richest athletes on the planet is an amazing achievement.